The men in my family really like beef jerky. It’s something that’s great as a stocking stuffer because they all like it. I’m not a huge fan of beef jerky but if there is a good one I’ll eat it. 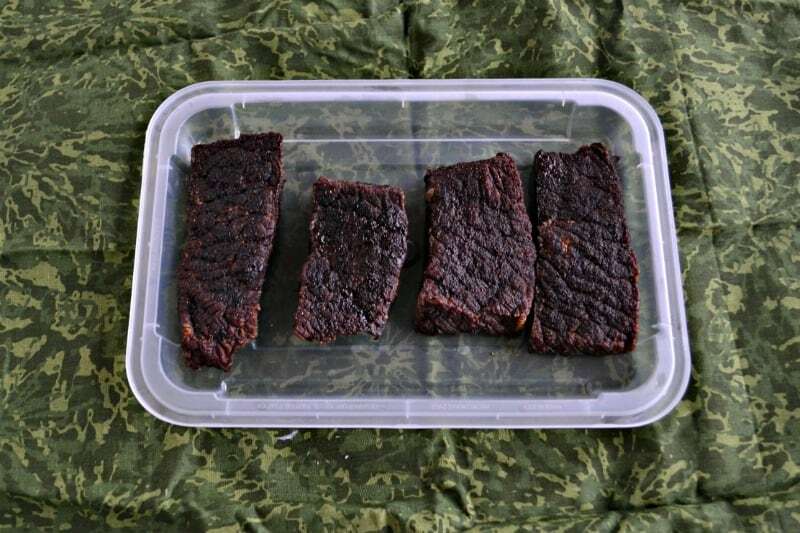 Lately I’ve come across several recipes for homemade beef jerky. I decided to give Michael Symon’s recipe a try because it seemed like the jerky wouldn’t be totally chewy and leather like. The only problem was I didn’t know how I would store it. I also thought it would be cool to give as a holiday gift. 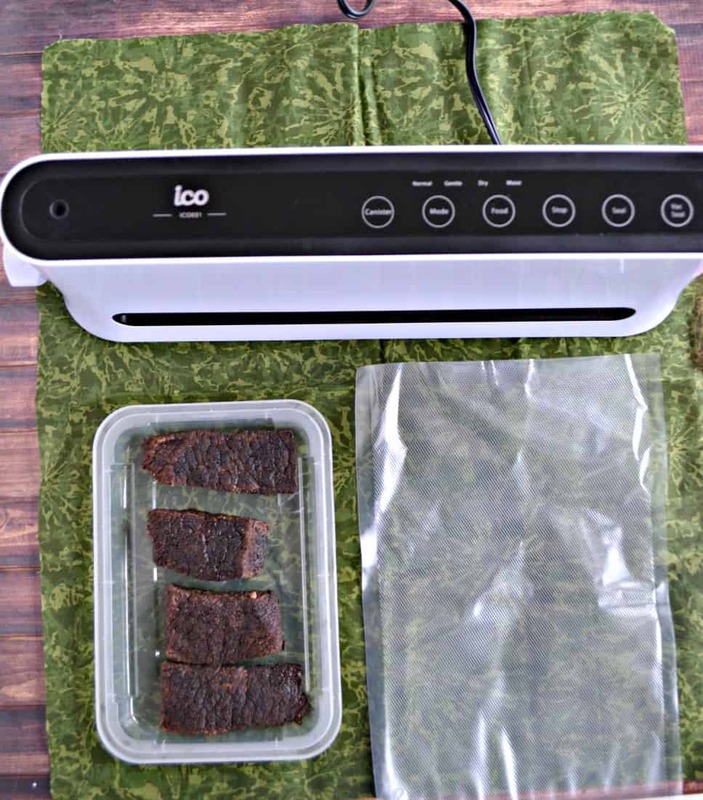 Enter the Impeccable Culinary Objects (ICO) Vacuum Sealer. I’ve never had a food grade vacuum sealer but I’ve always wanted to try one because sometimes we buy meat in bulk and then I freeze it. It will stay in there for a few months before getting freezer burn. 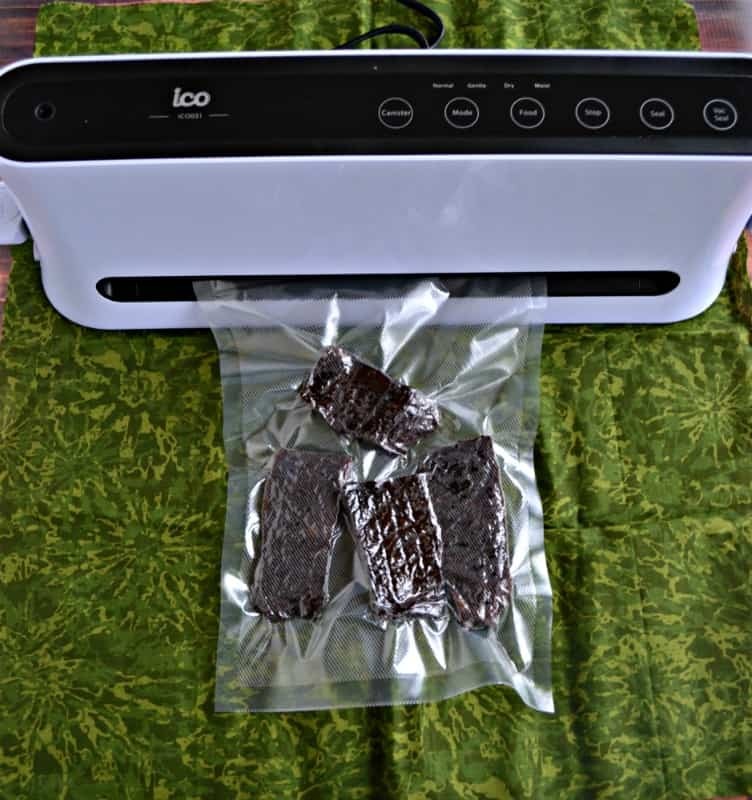 With this vacuum sealer it will last well over a year without getting freezer burn. 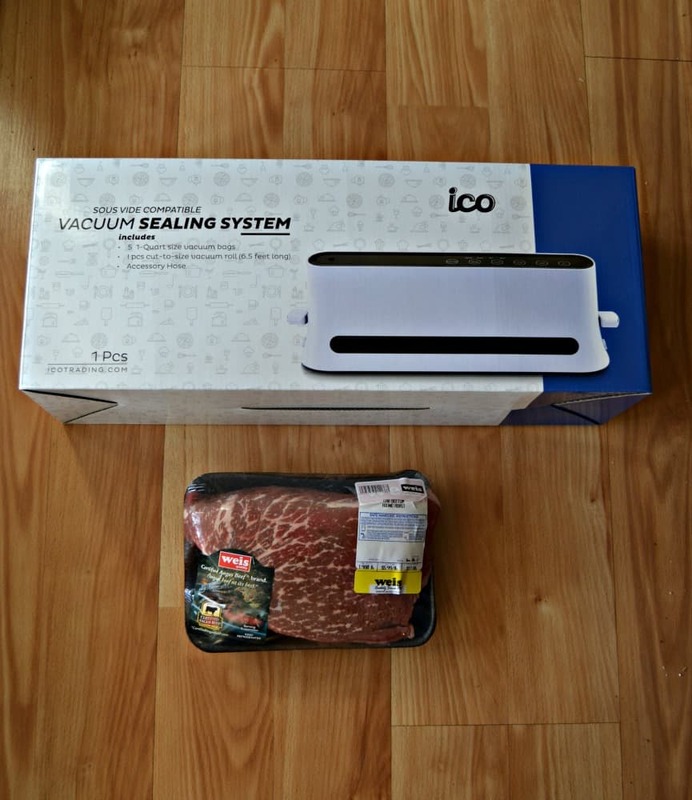 I tried the ICO Vacuum Sealer and loved how easy it was! I mean, all I had to do was plug it in, put my food in a bag, and hit the button. That’s it! My food was vacuumed and sealed in less then 30 seconds. I also love how small it is! I can put it pretty much anywhere to use. It comes with quart sized bags and a roll you can cut to size, Plus it can be used for sous vide. 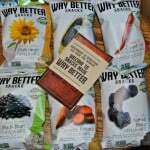 I tried it out with my homemade beef jerky. I started out with a Certified Angus Beef brand roast. I would have preferred to use an Eye of Round Roast but settled for Bottom Round. I sliced it into 3/4 inch thick slices and then rubbed it with a tasty spice mixture. 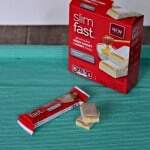 Then I covered it and refrigerated it for 24 hours. When I took it out I put it in the oven on low heat for 7 hours. It smelled so good! When it came out the beef was much smaller. It wasn’t as thin as typical jerky but I thought that made it better. It was tender and so full of flavor. I really liked it and think it will make a great holiday gift. To package it I simply put it in a vacuum bag, put it in the ICO Vacuum Sealer and sealed it up! I had it all packaged in under 5 minutes. 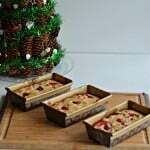 I wish I could say it made it until Christmas but my husband and I broke into it and ate it. 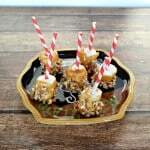 A delicious homemade beef jerky that is great for gift giving! 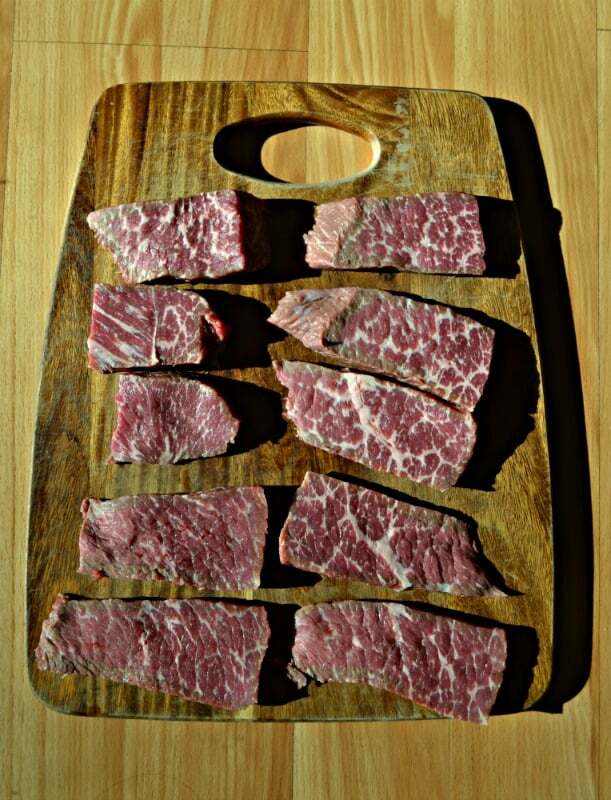 Slice the beef in strips that are ¾ inches think and 3 inches long. The strips will look big but will shrink in the oven. In a mixing bowl combine the spices and mix well. Season the beef slices with the spice mixture. Cover the beef and refrigerate for 24 hours. Preheat the oven to 250 degrees. 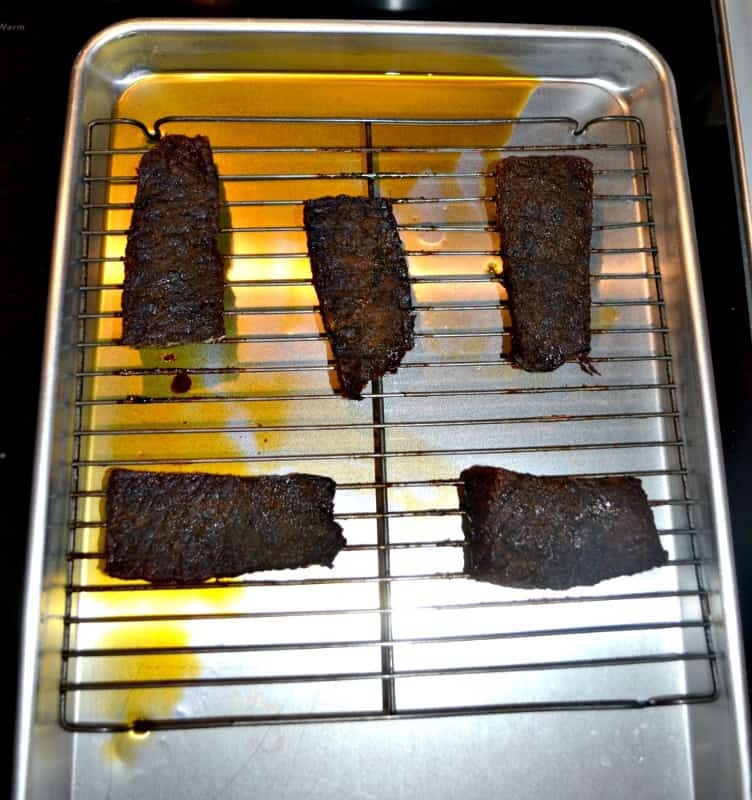 Put the beef strips on a wire rack sitting on top of a baking sheet. Make sure the beef is not touching or overlapping. Divide the jerky into bags and vacuum seal if possible. Store at room temperature for 1 month. I received the Impeccable Culinary Objects (ICO) Vacuum Sealer in exchange for my honest review. All opinions are 100% my own.